Friday’s UFC Boise event is in the books, and now that the dust has settled in Idaho, it’s time to go to the scorecard to see who the big winners were at CenturyLink Arena. The great thing about being a heavyweight is that you are always one punch or one win away from being back in the mix. And that’s where Junior Dos Santos sits today. More than a year removed from a knockout loss to Stipe Miocic and then a harrowing spell in which he was flagged by USADA only to be cleared a few months ago, JDS defeated tough newcomer Blagoy Ivanov on Saturday, and while he had to go the full 25 minutes to get his hand raised, that was good for him in terms of getting his timing and sea legs back. Now, it’s on to the next step, and it will be another big fight. Ah, to be a heavyweight. There’s always one of these “feel good” fights on the card where someone breaks a losing streak or scores an upset, and Cat Zingano fit the bill with her win over Marion Reneau. 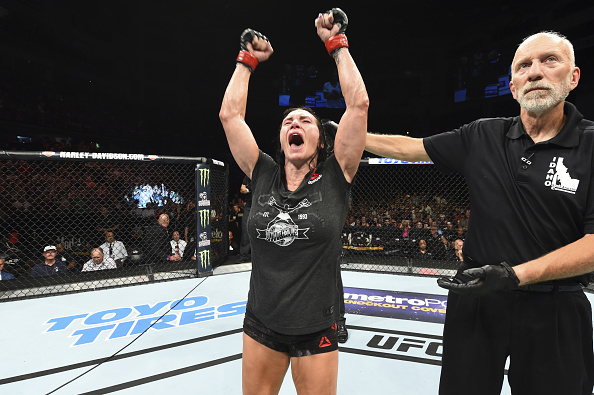 Sporting a three-fight losing streak heading into the bout, Zingano needed this one bad, and when she got it with a disciplined, “Do what it takes to win” effort, you could tell how much the win meant to her. Yes, I know people express themselves in different ways and it’s “cool” to have the poker face on all the time, but to see the emotion come out from Zingano after a long camp and an even longer losing streak, it was a reminder of the sacrifices made by professional fighters to make it to fight night. Believe me, I thought on putting Niko Price at the top of the list because I know I’m still thinking about his knockout of Randy Brown two days later. A talented and exciting welterweight, Price should be getting more attention from the fans than he has, but that should change after he held Brown’s head in place with his foot and then finished him with hammerfists from his back. I’ve watched a heck of a lot of fights since the first UFC in 1993, and I never saw – or heard – anything like that. In going 4-0 in his first four UFC fights, Alexander Volkanovski showed that he belonged among the best in the world in the Octagon, but I still thought Darren Elkins was going to be a little too much for him in his first U.S. appearance. Well, I was wrong again, as he knocked down and battered Elkins for three rounds en route to the biggest win of his career. Most impressively, Volkanovski didn’t give Elkins that daylight “The Damage” has used in the past to pull off comeback victories. Once he had Elkins down, yes, the Indiana native would stay in the fight, but the Aussie wouldn’t let him take it over. Two years and seven months is a long way to be away from anything, but in the fight game, it’s usually a death sentence. Chad Mendes may have something to say about that, though, as the three-time featherweight title challenger returned from a two-year USADA suspension to not just beat the always tough Myles Jury, but to knock him out in the first round. Talk about jumping right back into the mix.